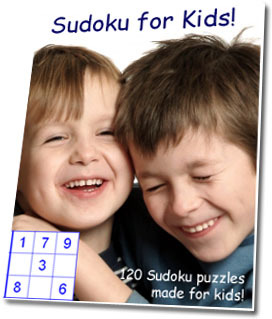 « Japanese Puzzle Box – The Ultimate Gift for The Kid Who Can’t Get Enough of Puzzles! Updated April 20, 2016 – I’ve been racking my brain trying to find a fun way to introduce cryptograms for kids. Then I remembered why I got interested in cryptograms in the first place. I wanted to be a Super-Spy when I grew up, of course! And part of being a Super Spy is being able to read secret messages, just like cryptograms. So I thought, why not combine the two and make decoder wheel a part of solving our cryptograms? And of course, a secret decoder is one of the must-have cool spy gadgets for kids who are SERIOUS about being Super Spies themselves. Introducing the Kids Puzzles Online Secret Decoder! So, for Kids Puzzles Online’s beginner cryptograms for kids, we are introducing the concept of the Decoder Wheel. 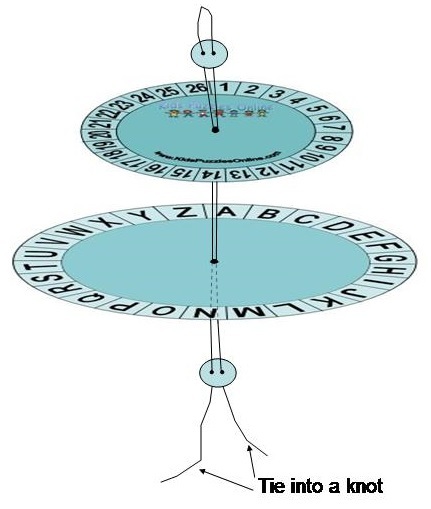 The decoder wheel is based on the famous Caesar Cipher, named after Julius Caesar who used such a wheel to send secret messages to his many spies throughout the Roman Empire. But here at Kids Puzzles Online, we will also be using it as a tool to teach kids how to solve cryptograms by 1) starting to get the kids used to deciphering codes of course, and 2) by using simple recurring words and letter combinations in our puzzles (such as the, and, is, in, in the, is the, str, ie, etc. ), we expose them to common word formats, sentence structure and grammatical patterns which will help to develop their skills in deciphering cryptograms – and all this without making it a long drawn out English lesson! WHEW! But even better, a Decoder Wheel is so easy to make and a fun activity to do with your child. So, spend a nice afternoon to make decoder wheel, and then reward them with the fun puzzles they can solve using the wheel. 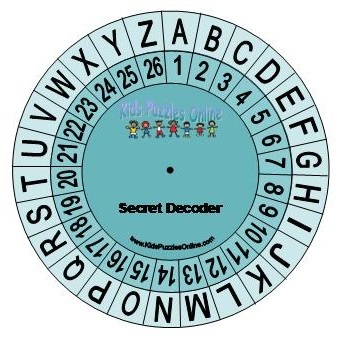 Plus, if your kids are into the spy thing like mine are, why not have them also custom-make decoder wheel to give to their BFF (or spy team), so they can write secret notes to each other. Click Here for the Kids Puzzles Online Secret Decoder or enter your email below so I can send you a blank customizable template. First sew in the back button. Then, going from the back of the outside wheel, poke the needle through the center (where the dot is). Then sew in the front button. Now you go backwards. If you have a button, poke the needle through the other hole first, then continue onto the next step. Otherwise, if you have a bead, just skip this step. With the needle, poke back into the front hole of the inside wheel. Then the front hole of the outside wheel. You’ll now end up with your needle and thread at the back of your wheel. Finally, poke it through the other button hole (if using a button), or simple tie a firm knot. The front and back beads/buttons will stop the string from going through. and start solving cryptograms for kids. James Bond move over, this spy watch is all the rage here in Ohio! When we bought this watch last year for Christmas, our ltilte guy (8) couldn’t wait to use it. Went to bed with it on, picked up spies all over the world (easy, since he knew what time it was) and he LOVED writing messages and sending them off to his spy friends. The imagination this thing sparks is nothing short of amazing. He still loves it and uses it all the time. Highly, highly recommend. James Bond move over, this spy watch is all the rage here in Ohio! When we bought this watch last year for Christmas, our litlte guy (8) couldn’t wait to use it. Went to bed with it on, picked up spies all over the world (easy, since he knew what time it was) and he LOVED writing messages and sending them off to his spy friends. The imagination this thing sparks is nothing short of amazing. He still loves it and uses it all the time. Highly, highly recommend. Hello! I could have sworn I’ve been to this website before but after looking at some of the articles I realized it’s new to me. Anyhow, I’m definitely happy I found it and I’ll be bookmarking it and checking back often! My granddaughter LOVES her spy gear. The only draabwck to this watch is the teeny tiny secret message capsule. Cool in theory, but a little too small. She still loves to use it, but has trouble manipulating it alone, and gets frustrated to have to ask the enemy (aka parental units) for help putting her message back into the capsule.I’ve included my review of the spycase breifcase below these are some cool toys for kids.My granddaughter LOVES this toy. We gave it to her for her 7th birthday. She is in super-spy mode from daylight to dusk, and then some. We call her Ms. Shin Impossible. She has played with this almost non-stop for 3 weeks now. We also got her the wristwatch she loves them both. We’ll be adding to her spy collection for Christmas. One of the great things about this case is the extra room it has in it it’s secret compartment. She has such a great imagination and will turn any common object into a spy something-or-other and store it in her super secret spycase compartment! The intruder detector is also great fun for her her friends. this really is a fun, durable toy for kids that like to pretend they’re a spy. Techozoic 2.1.1 by Jeremy Clark. | 40 mySQL queries in 0.484 seconds.